For the 4th year in a row we embarked on the Parry-Furlo Camping Trip. I told my grandma we were staying in a yurt and she didn't know what that was. Behold Grandma! Above is the outside, below is the inside. Think of it as a really cheap cabin, without running water. Here's Jessi & Kellie enjoying dinner around the campfire. We had a ton of wood this year too. We kept a bunch of scraps from our fence project and Jessi brought home a couple of old pallets. David provided the long burning logs, which meant we had a healthy fire pretty much the whole time. One of my favorite parts is roasting items over the fire. 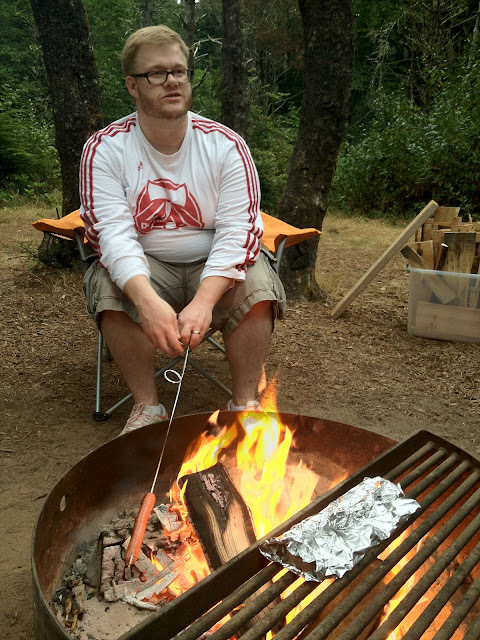 Here's David getting after it with a hot dog. I especially love bagels in the morning. Grace & Ethan are definitely growing up too! They both had a ton of fun. Ethan & I tossed the football around a ton... Sometimes a little too close to the fire (it might have landed in the fire once...). I especially enjoyed telling stories with Grace the second night. Of course, we brought Vinnie. And since we got a pet-friendly yurt, he was able to sleep with us. A new addition to the trip was Zoe. She also seemed to have a good time hanging around the campsite and going on walks. She even seemed to get along pretty well with Vinnie, which hasn't always been the case. Oh yeah, and proof I made it on the trip too. We went on a walk to the lake you see behind me. It was a beautiful day on the Oregon Coast. For those of you with keen eyes, you'll notice all of us are wearing jackets. That's how it goes on the Oregon Coast. Of course, that didn't stop one older lady from diving into the water and going for a swim! Thanks for the fun trip Parry clan! We're looking forward to next year already!